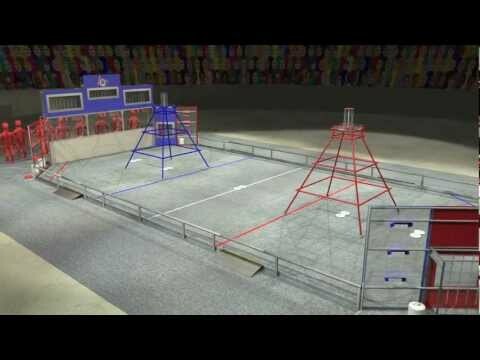 Find official answers to your game questions on the FRC Q&A: https://frc-qa.usfirst.org/Questions.php. All comments should embody the FIRST values of Gracious Professionalism® and will be moderated prior to posting. Thank you for helping to keep the conversation civil and productive. This will be a challenge, but will be lots of fun and Team 3997 is up to the? challenge. GOOD LUCK TO ALL!!!!! My Team was 3324 and i wish all players good? luck in the season! I think FIRST got so tired of the “Do you? even lift?” comments that it made a game where the answer was “Yes”. looks like we’re gonna need it to climb those towers.? Oh, this will be interesting to see. While I’m excited to see what my team comes up with (I’m an FRC alum and now the media/PR mentor for 1922) I’m? excited to see what everyone else comes up with too! Good luck to everyone! do you have to try for bonus points or can you just keep shooting till the end? How about the other way around? and just try for bonus for whole match? My team has a? good frisbee thrower as well. Can’t wait to see what? teams come up with this year. Good luck everyone! Good Luck? From the ASTI Aztechs #4186! Good luck from team? 1523!